Summer is just around the corner and we are ready for camps filled with field trips and fun! Each session will be one week long and feature 3 trips total with Thursday as pool day. Save 15% Off when you register between April 4 - 18 on weekly sessions. Cash for Campers is the best way to register for any or all of our summer camps at an early bird discounted rate! Cash for Campers Summer Camp Early Bird Registration runs April 4 - 18, 2019. Enjoy 15% Off savings with the coupon found here. 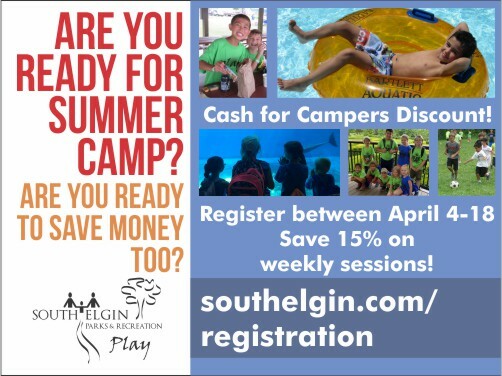 Visit southelgin.com/recreation to view our camp options and to learn more.